On one of our road trips we picked up this tall boy with an interesting curved side feature and loads of drawers. 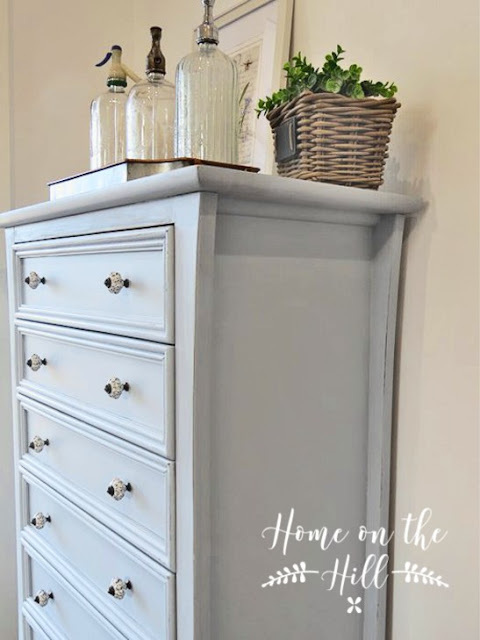 It was a fairly new piece of furniture - definitely not vintage, which meant it had the advantage of metal drawer runners and with all those drawers that was a positive! 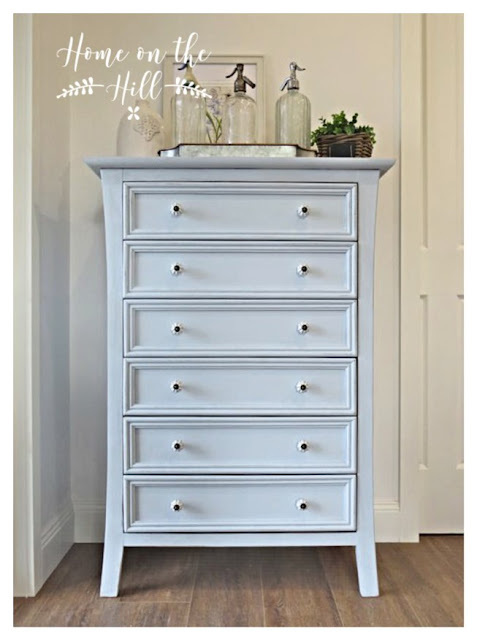 It still had good construction though for a newer piece, dove tailed drawers and despite it's slightly feminine delicate look it was solidly built. A few of the drawers also needed some light planing to get them to fit well, this can be especially important if you intend to paint the edges of drawers that fit into the cabinet as the extra thickness added by 2 layers of paint can make all the difference to the drawers jamming or not. As you may, if you have read my 'W' post, story I had quite a number of blue/grey paint sample pots left over. So waste not want not. I set about finding one to suit what I wanted for these drawers, a soft blue, not too nursery or too grey. After painting some test patches on the front of a one of the drawers, I took the draw to the place in the house where the tall boy would live, in the dining room. In that light I could see which colour suited the location best. I painted it with a roller, giving it a second coat after the first had dried. 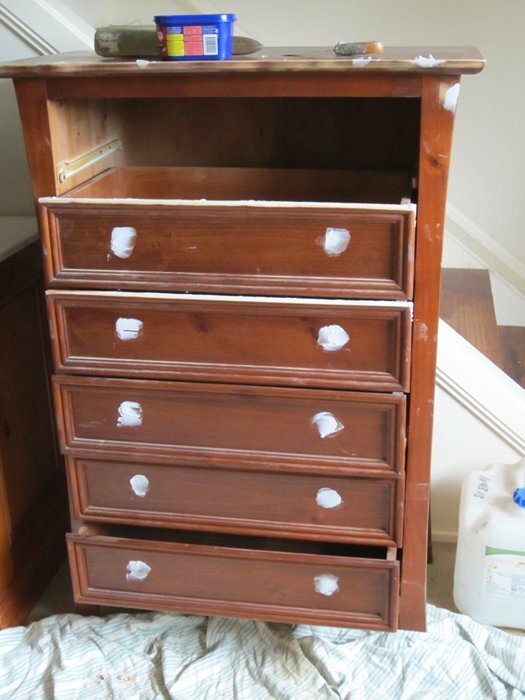 I then went over it with a fine sandpaper - 180 grit - to lightly distress it on the edges of the drawers and down the side and top edges were wear and tear would naturally occur. I haven't as yet sealed or waxed this piece, I wasn't sure if the blue was still a little strong, so want to live with it a while first. 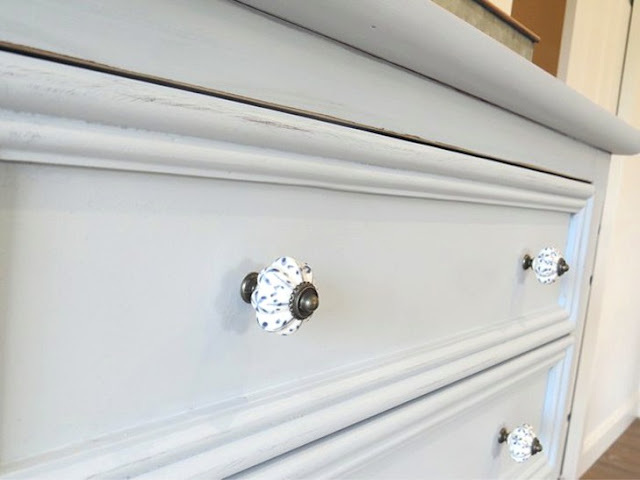 I am considering using a white wax to tone down the blue just a little and add some variation to the finish. Last step, adding the handles. It did have some rather chunky heavy metal ring style handles that rubbed against the drawer when it was opened, so they had to go, plus they didn't have the farm house vibe I was after. So my husband removed them and filled the holes which were not centred to the drawers and I drilled new holes in the correct position for the knobs I had. We replaced them - all twelve of them - with these cute ceramic and aged brass pumpkin knobs with a gentle blue pattern. I originally had eight of the same style of knobs I had bought online last year, so ordered another four. But the seller advised me the colour of the blue pattern had changed slightly to a more grey blue - perfect! The colour change was just right for this piece, but the downside was I now needed to buy twelve new matching knobs. Luckily they were not too expensive and I still have the other set of eight to use on another project someday. 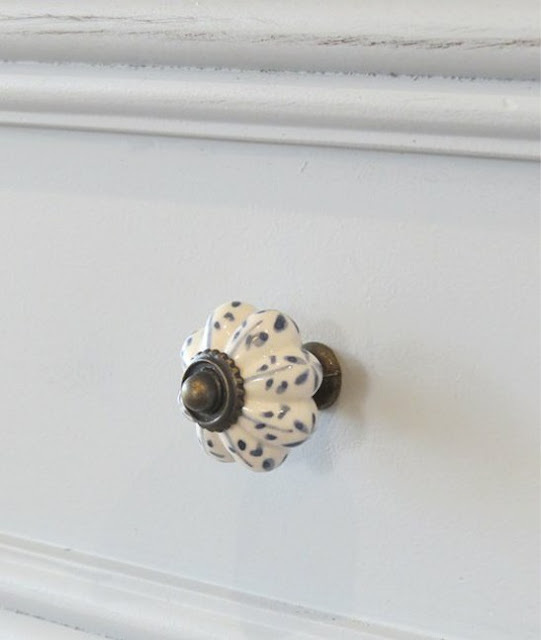 Here is a close up of one of the knobs, they are just right size wise for this piece as well, any larger with so many knobs they could have looked too dominating. The finished piece in place, waiting for me to fill all those drawers with table linens and other dining room related bits and pieces!